Put the chickpea flour into a large bowl and add the water. Whisk until the mixture has a smooth batter consistency. Squeeze the grated zucchini in a clean, dry tea towel to remove extra water content from it. 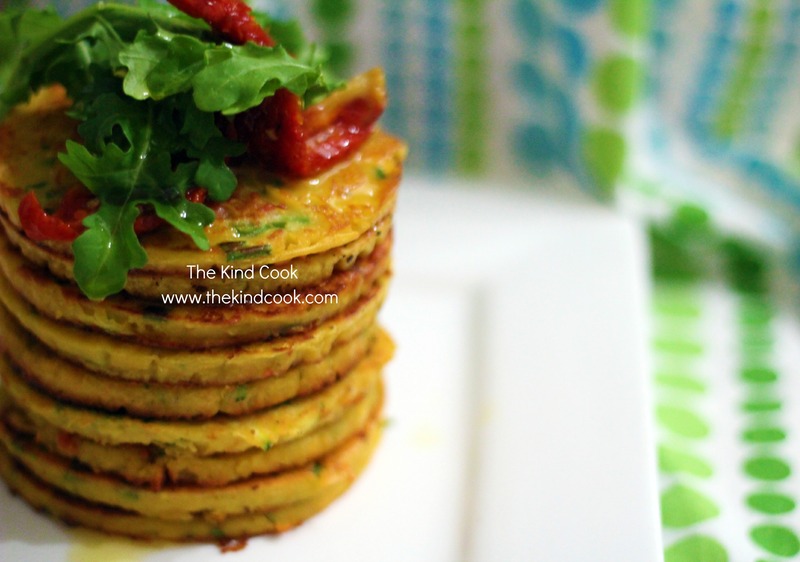 Add the zucchini and the rest of the ingredients to the batter and mix well to combine. Gently heat a small non stick pan with enough oil to grease the pan (I used the oil from the semi dried tomato jar). Put a well greased pancake ring (I used one because I wanted my pancakes to look pretty) in the pan and pour in just under ¼ cup of the mixture (I used a 1/4 cup, cup measurer). Each time you scoop up ¼ of a cup of the mixture make sure you stir the mixture first so that all the fillings are well distributed in the batter. Watch your pancakes while they are cooking and when you see bubbles on the surface of the pancakes and also when you touch the sides and they have firmed slightly, gently pull the ring up and place it aside. Then turn the pancake over with an egg flipper. Do this GENTLY. Cook until till browned. I served mine with a spicy eggplant pickle, semi dried tomatoes and rocket. Yields: Makes 10 depending on the size of the cooking ring you use and if you use a ring. Notes: If your batter is too wet, simply add more flour and if it’s too dry add more water..
You REALLY want your oil to be fairly hot before you pour the batter onto, otherwise your pancakes will be soggy and oily. Not too hot though or they will burn. A gentle to medium heat after the batter has hit the pan is perfect, because you want your pancakes to cook through. If your pan gets too hot at any stage just remove it from the heat. Remember like all pancake making sessions that the 1st couple are usually crap and they get better as you keep cooking. If your pancakes stick a little to your cooking ring when you try to lift it, just get a small, sharp, thin bladed knife and gently run it around the edge of the ring to release the pancake. These are also lovely with corn, but I do find ingredients with strong flavours like those I have listed or by adding things like olives, capers, spring onions etc work best with besan flour as they compete well with the strong earthy flavour of the flour. As with most of my recipes, they begin with something I need to use up. Today it was mushrooms. I started out with the intention of making a mushroom soup but felt inspired to find a use for some black sticky rice I recently purchased. I also was curious to make gyozo for the 1st time. It was so much easier than I had imagined. I hope you give it a shot. While your rice is cooking, heat some oil in a pan, turn down to a medium heat and cook the onion until it starts to colour, add the garlic and the ginger and continue cooking for a couple of minutes. Add the chilli and the mushrooms and cook until the mushrooms have softened coloured and cooked right down. Once the rice is cooked add it to the mushroom mix and stir well to combine. Lay out your dumpling skins. Place approximately 1 teaspoon of mixture in the middle of each skin. DON’T be tempted to overfill them because you will tear the skins and/or struggle to seal them. Wash your hands and get a small dish of cold tap water and place next to your dumpling rows. Wet your fingers with the water and dab you fingers around half the dumpling skin circle on the side furtherest away from you. 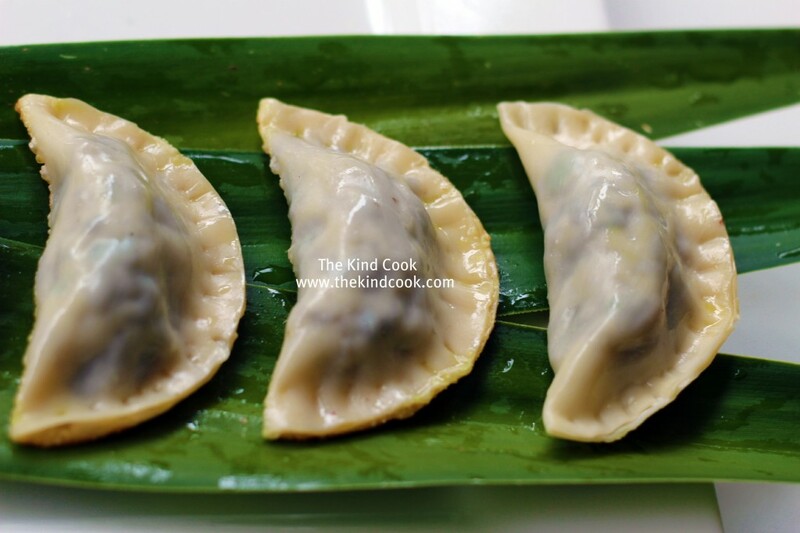 Doing 1 dumpling at a time, gently pick up the side closest to you and gently fold it over the top of the filling…folding away from you. Gently press the flat half moon side of the gyozo. Repeat this process untils all your dumpling skins are now little half moon gyozos. Using a fork make small indentations on the flat part of the gyozo. This helps close the seal and also decorates it. As you finish your batches pop the aside on a spare bit of bench or plate and lay out your next batch. Once all your gyozos are assembled, put a large non stick pan on the stove top and add approx a centimetres worth of water into it, along with a couple of tablespoons of olive oil and bring to the boil. Place your gyozos in batches (not touching) into the pan, flat side down and cover with a wok top. Cook on high heat with top on for a few minutes, then remove the top and allow the water to evaporate. As the water gets lower turn the heat down to a simmer until all the water is gone. Check that your gyozo are not sticking. If they are just add a little more oil and continue cooking until almost all the water is almost gone and the bottom of your gyozo are coloured and put aside. Repeat this process in batches until all your gyozo are cooked. You should end up with sticky, steamed tops and crunchy, coloured bottoms. Freezing: Perfect for freezing. I popped a lot in the freezer on a plate (not touching) and once frozen popped them in a sealed container for a quick dinner or snack for another day.